ELC Lighting is excited to announce two additions to the product range; the dmXLAN SwitchGBx 10 (ELC-DLS10GBX) and the dmXLAN SwitchGBx 18 (ELC-DLS18GBX). These new switches enable you to set up fast redundant loops with easy fault detection. The dmXLAN SwitchGBx 10 contains a total of eight ethernet ports supporting speeds up to 1GB and 2 SFP cages for fiberoptic modules capable of speeds up to 2.5Gbps. The four ethernet ports located on the front panel support Power over Ethernet (PoE) and are equipped with an RGB LED to indicate the status of the port and the programmed VLAN. The dmXLAN SwitchGBx 18 provides 16 Ethernet ports supporting speeds up to 1GB and two SFP cages for fiberoptic modules capable of speeds up to 2.5Gbps. There are eight front panel ethernet ports on the dmXLAN SwitchGBX 18 and these too support Power over Ethernet (PoE) and are equipped with an RGB LED to indicate the status of the port and the programmed VLAN. For further details and a full list of features please visit the product pages for the dmXLAN switchGBX 10 and dmXLAN switchGBX 18. In addition to the new dmXLAN switches, ELC Lighting introduces the dmXLAN NodeGBx 8 (ELC-DLN8GBX) – a brand new node that comes in two variations. The DLN8GBX version is a stand-alone node containing eight fully programmable DMX ports and a dual Gigabit port switch with a user interface. The DLN8GBXSL version has eight fully programmable DMX ports and a dual Gigabit port switch and is only intended to operate as a slave to the dmXLAN switchGBx product range. 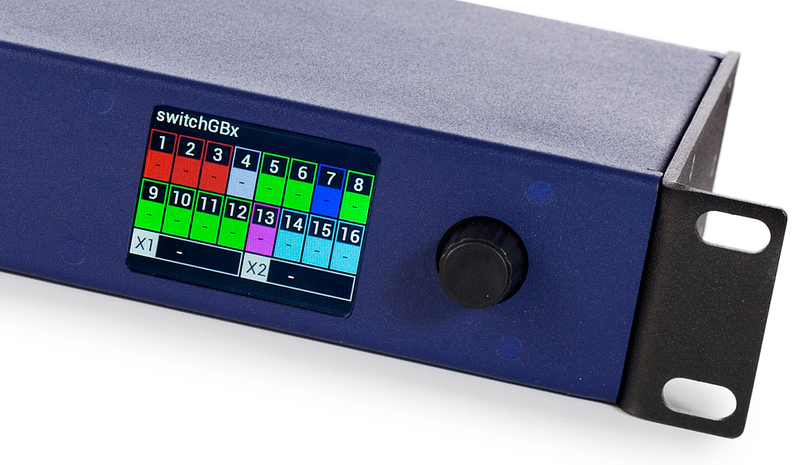 Using the dmXLAN switchGBx 10 or dmXLAN switchGBx 18 as a master control for the new NodeGBX 8 slave version you can substitute the traditional set of one switch, one node and five or more splitters in a very cost effective way. The dmXLAN NodeGBx 8 has two ethernet ports for speeds up to 1GB that enable easy daisy chain connection. Each DMX port has an RGB LED indicator which can be programmed via the dmXLAN V4 software. A new feature of the NodeGBX is it’s ability to continuously measure the I/O connections. Any changes and errors that are detected , such as faulty cables or wiring, appear on the node’s display and in the dmXLAN software. All open lighting protocols – such as Artnet, sACN, ShowNet and NET3 – are supported by the dmXLAN NodeGBx 8 nodes. The NodeGBx range can even interact with serial LED strips (WS2811/WS2812 chips), thereby eliminating the need for an additional interface. For further details and a full list of features please visit the product page for the dmXLAN NodeGBx 8. The Easy Setup software is our new user-friendly application for configuring dmXLAN Nodes and Switches. Easy Setup allows you to create VLANs and safety loops at the click of a button. Alternatively, easy programming is possible on the implemented colour touch screen of the dmXLAN switchGBx range or remotely through our dmXLAN V4 software.